Definitive editions are becoming increasingly popular for many game developers these days, allowing them to revitalize their aging titles with graphical tuneups, DLC inclusion and other options to rope in new fans. Just look at the recent Metro: Redux titles and the Definitive Edition of last year’s Tomb Raider. This time, tower defense game CastleStorm is getting its own Definitive Edition treatment. CastleStorm: Definitive Edition comes packaged with, among other things, both DLC, namely the campaign packs From Outcast to Savior and The Warrior Queen which both offer new characters, battles, weapons and achievements. Other additions include new spells, full support for 1080p resolution, improved textures and character models, and voice support, which requires a PlayStation Camera. You can check out the launch trailer below, which, rather disturbingly, features random scenes of people getting chopped to bits while happy music plays in the background. This upgraded version of the game is, rather unfortunately, not available to owners of the original game at any discount. “Sorry, we don’t have a way to offer discounts if you purchased a previous version,” reads a response from one of the developers to a query on developer Zen Studios’ blog, “We certainly don’t expect players to buy the game again if they already own it.” Additionally, this version of the game will not be a cross-buy title, unlike the original version on the PS3 and Vita. 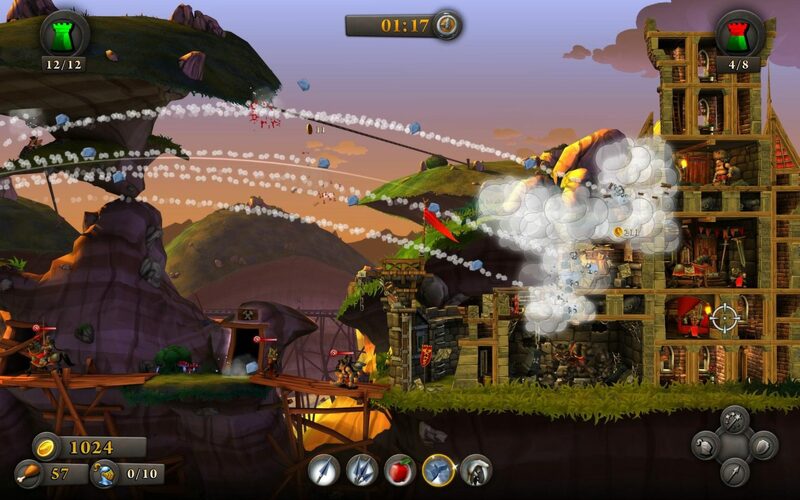 PlayStation 4 owners who are curious about Castlestorm will find it to be a blend of ever-popular tower-defense mechanics and the physics-based gameplay of Angry Birds. Players construct their castle to their liking, purchasing various components like armories, guard towers, onagers and so on, and position them in tactically sound locations. From here, they can also deploy a variety of knights, orcs, gryphons, and other medieval/fantasy characters to do battle in glorious 60 fps action. Sandwiched between all this is a the game’s distinct sense of humor, which often involves the use of sheep. Features include a story-driven single player campaign, online adversarial multiplayer, cooperative modes, and a custom castle editor. The original CastleStorm was well received, and it currently boasts a 79 rating on Metacritic, so there’s little reason to doubt that the Definitive Edition will be worth PS 4 owners’ time and money. The game is available on the PlayStation Store for $9.99.